This page describes the SHOW research project, a project of the French Ministry of Research program on Massive Datasets. SHOW is a joint research project between the ALICE research team (of LORIA), the ARTIS research team (of INRIA Rhone-Alpes), the IPARLA research team (of INRIA Futurs) and the REVES research team (of INRIA Sophia-Antipolis). Aurélien Martinet will start a post-doctoral stay at the ALICE research team in November 2006. Florent Duguet (REVES research team) spent four weeks in April 2005 at the IPARLA research team; this visit resulted in a joint publication. 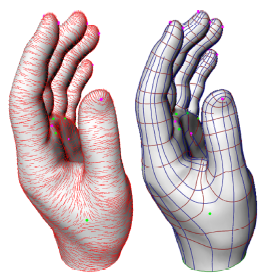 First, to develop automatic techniques for structuring massive 3D models. 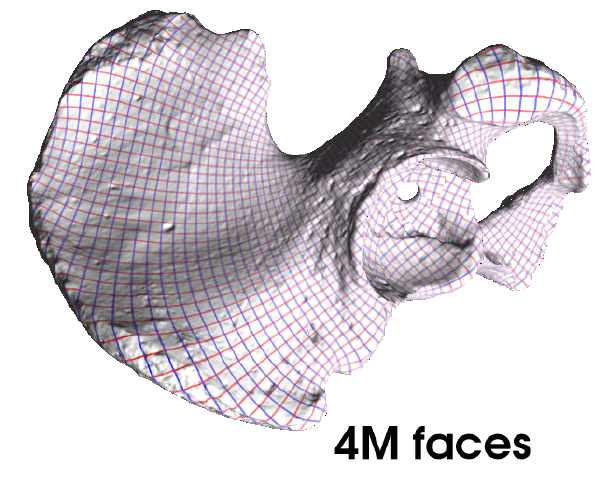 This automatic structuring can be accomplished either by automatically generating 3D models with inherent structure, or by proposing techniques that create structure a posteriori on existing massive 3D data. Second, to develop visualization techniques exploiting the structure of massive 3D models. Here again, two approaches are possible and will be followed: either by adapting existing visualization techniques to only use at any given time the relevant information; or by proposing new visualization tools (notably non-photorealistic ones) that can benefit from the structure to emphasize some characteristics in the data. 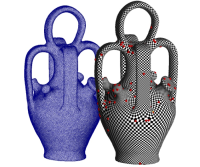 The group of proposers brings together research teams at the forefront of research on digital geometry processing, the simplification or hierarchisation of 3D models, hierarchical visual or audio rendering, and non-photorealistic rendering. 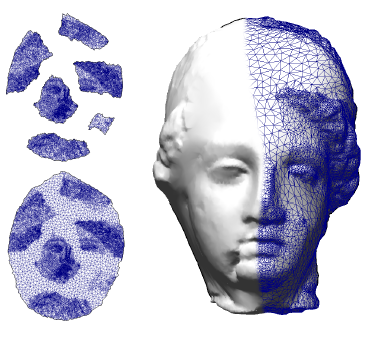 Digital 3D data nowadays comes more and more from automated processes, be they digitization processes, digital reconstruction methods (from photographs), procedural models, interpolation or extrapolation of existing models (e.g. terrain models). However the complexity of these scenes requires efficient algorithms to process and visualize them, and sub-linear complexity can hardly be achieved when no structure is present. In this proposal we consider massive 3D data of different classes: large triangulated models, such as architectural or urban models; digitally sampled models, such as point clouds from 3D digitizers; digital audio data involving multiple audio sources in 3D models. 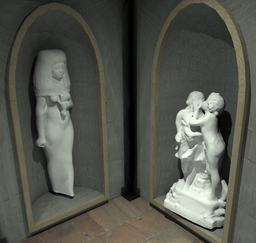 One approach is to identify and compare parts of a 3D scene: topological filtering techniques, as well as the use of specialized application data, will let us identify and define relevant parts or objects in the scene. Work in this direction at ARTIS has resulted in an algorithm for automatic generation of streets in an urban environment. We will also seek appropriate descriptors for 3D shapes. Finally we will develop techniques for the spatial and perceptual structuring of scenes with audio content. We want to develop a flexible rendering architecture based on a server-client model with a variable boundary, in order to accommodate the predicted variability both in terms of on-demand sampling capacity (server) and in terms of terminal capacity (think of using devices ranging from cell phones to Pcs to virtual reality centers). We will investigate efficient and hierarchical algorithms for point-based rendering, exploiting hierarchical data structures developed in the first research direction. Hierarchical clustering will also be used to define appropriate rendering processes for audio. Finally, we will define flexible structure- driven rendering processes that will make use both of realistic rendering methods, and non- photorealistic techniques, to extract a set of relevant objects/primitives and propose an appropriate rendering, adapted to the application. For more information, you can look at the initial proposal, and the half-way report. Florent Duguet defended his PhD on June 27, at University of Nice. Meeting of all participants in the project in Paris, May 27. The ISA research team in the proposal was replaced with the ALICE research team. October: The REVES research team visits the IPARLA research team. September: Aurelien Martinet is recruited as a PhD student, funded by SHOW, in the ARTIS research team.